This page will introduce professional partition software for Windows SBS 2003 users to expand size of system partition without formatting 2003 or reinstalling sbs 2003. Download IM-Magic Partition Resizer Server to resize hard disk so as to fix low disk space problem on Windows SBS 2003. When your Windows SBS 2003 is running out of space on system partition, what can we do? Don't panic! Most often, you wont like to reinstall the operating system. But can you extend c volume without reinstalling the sbs 2003? Due to the importence of the consistent working of Windows Server, it may do not want a down time. Here the Partition Magic Resizer Server can help resize/extend system partition by moving free space from other partition on the same hard disk without reinstalling system or touching data on the partition. All Windows Servers are supported by this partition software. Download, install and launch IM-Magic Partition Resizer Server. 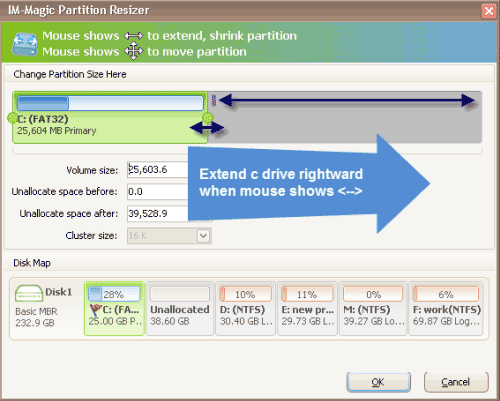 Right click a partition that has much free space and select "Resize/Move" option. Move the unallocated space close to system partition. Then, right click system partition and choose "Resize/Move". You can add the unallocated space to system partition by moving the arrows and then click "Apply" button. "Hello! The system partition on SBS 2003 Server which has a RAID 5 volume and the system has a low disk space after a few years of running. 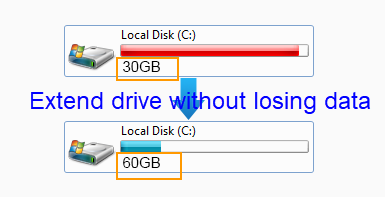 I doubt if I can expand the system partition space with formatting the disk? If anybody has the similar experience, can you tell me how to resize the system partition without reinstalling the SBS 2003 operating system?" Traditional method to resize system partition can be a time-consuming work because it usually takes a long time to reinstall system and reboot PC. If you can use IM-Magic Partition Resizer Server, it will be time-saving which allows you to extend system partition whether it is FAT32 or NTFS file system without rebooting computer. You even have no need to backup data before partition resizing, because this software enables you to extend system partition and remain all data untouched. Did you meet the similar problem on Windows Server 2003 or other Windows Servers? In fact, you can use the same method to extend system partition on other system when receiving low disk space warning on Windows Server.